ERP stands for Enterprise Resource Planning System is for any type businesses or organisations to manage things like product, invoicing, inventory, payroll, finance and lot mores. Dolibarr is one of free open source CRM and ERP Systems to manage small or medium type of business ,companies or orgarnisation . The target of Dolibarr is aimed for small and medium sized organisation. It manage end to end management to your business to keep invoice track, contracts, orders and documentation etc. Because of it is open source nature ,it offers to be run on LAMP Server ( Linux, Apache, MySql , PHP ), WAMP . This software also available with auto-installers for non technical users .Dolibarr is very easy to install , set up , use and develop for non technical users. DoliCloud also provided through cloud server providers. This software is having lot of advantages and features , some of them are below. Here are my system output in checking prerequisite configuration. Ok This PHP supports variables POST and GET. Ok This PHP supports sessions. Ok This PHP support GD graphical functions. Ok This PHP support UTF8 functions. Ok Your PHP max session memory is set to 128M. This should be enough. Ok Configuration file /etc/dolibarr/conf.php could be created. Ok Configuration file /etc/dolibarr/conf.php is writable. Make sure the system should be updated , if not then you can update and upgrade through below command. First add the eldy repository for dolibarr, through below command and press ENTER to add . Installation through Downloaded Debian file. 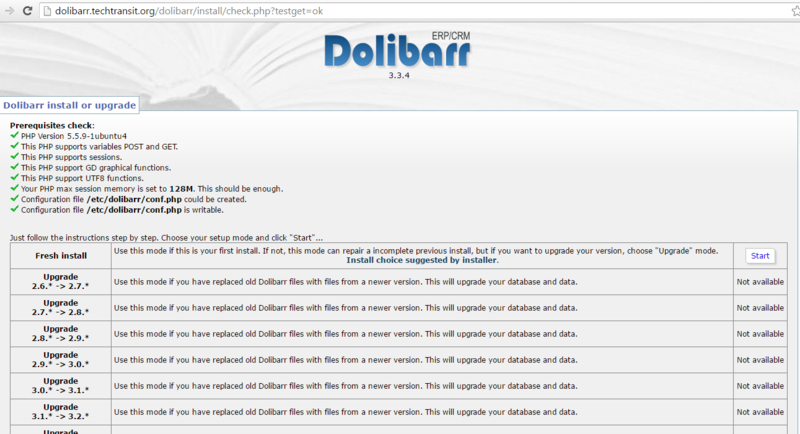 First Download the .deb package from download its official page dolibarr.org and it will redirect to source forge . you can download directly from here. Here X.Y.Z means version and release or you can just put your package full name with dpkg utility. If you are getting the issue of dependency, then you can put below command with package name. Here I have start with my new fresh server of Ubuntu 14.04.4 LTS . So I have run apt-get , This command will install dolibarr with its dependency server packages like MySQL ( MariaDB ), PHP and Web Server Linux Apache. In the process of installation set up will ask to you password of mysql database password . After installation of dolibarr package the set up will not completed . Now you need to complete web based installation steps which you can run through your favorite browser. You can run as with ip or domain name , if you have pointed the domain here like I have done. STEP 1 : After run in the browser web installer , the dolibarr screen will show setup . Just click on finish Dolibarr install process and this will be go to next process. STEP 2 : Now set up will test Hosting Server software prerequisites check. 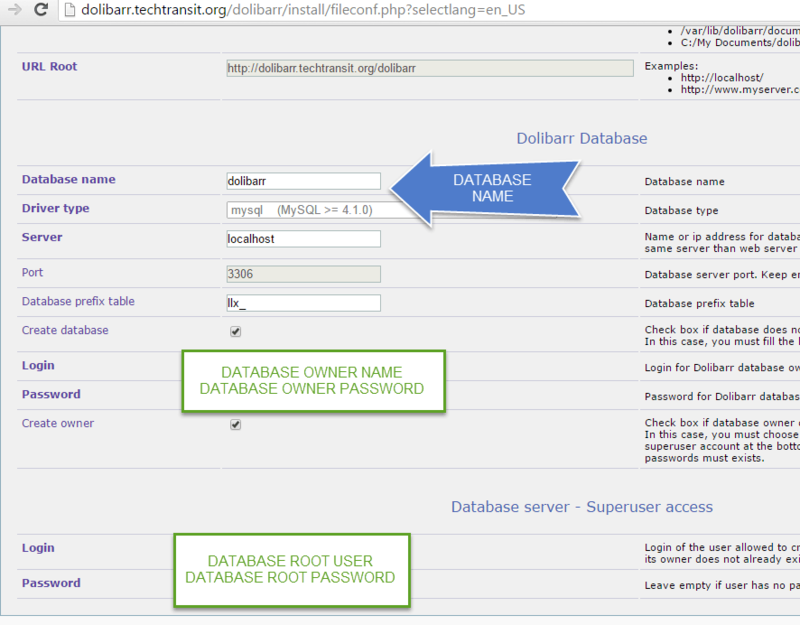 STEP 3 : In third steps , database configuration will be done, database username and database password of user root and user database for dolibarr database will be set up and then press Next. STEP 4 : Installer will check and Set up configuration .Now proceed to Next Steps . STEP 5 : Database object will created through installer. STEP 6 : Now Control panel will show Admin login creation wizard, fill the field and proceed for Next step . STEP 7 : Now admin login has been set up properly and Now you can use the dolibarr panel for management. STEP 8 : Now Login page or URL will show like below . STEP 9 : Now Admin Login page will displayed and you need to setup parameter like company and module setup. 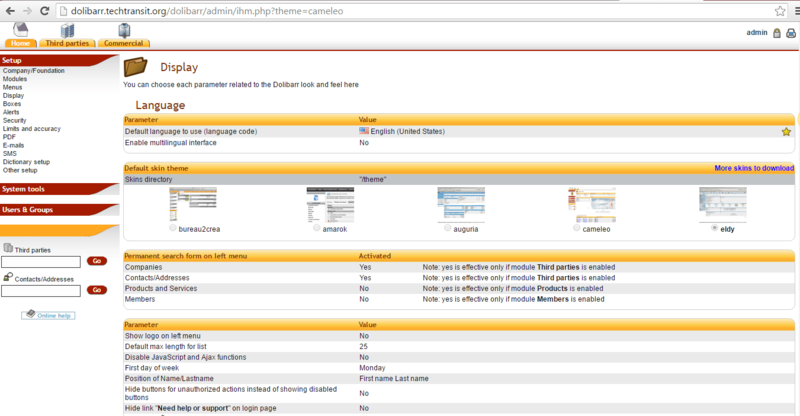 STEP 10 : After Change or setup company / Foundation , Module, we have changed display theme, you can also check themes, which is provided by default in dolibarr . Here we have set up dolibarr easy erp . Now you can manage your bussiness with dolibarr erp . Have a good Luck.